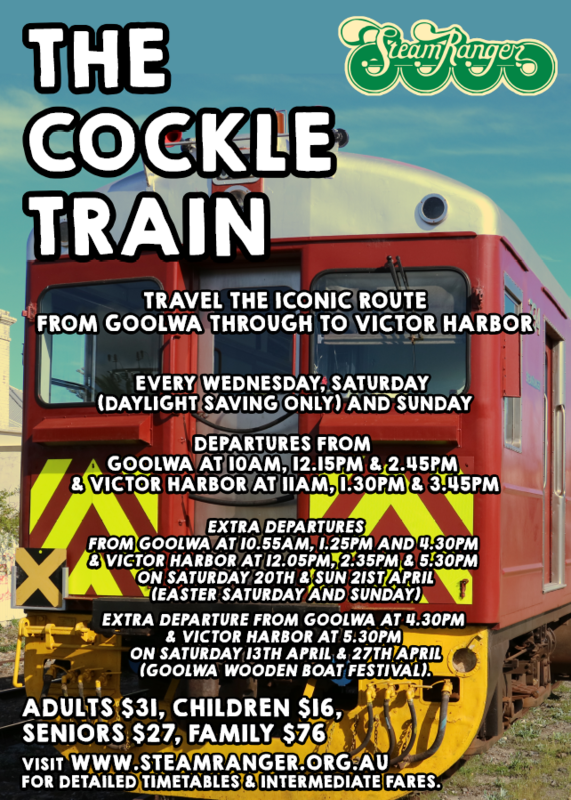 The Cockle Train is based at our Goolwa Depot and commences its run each day at Goolwa station, in the historic Wharf Precinct alongside the River Murray. After crossing the main Goolwa to Victor road the line heads off across the plains to Middleton, picking up or dropping off passengers on request, and then to Port Elliot where it reaches the Encounter Bay coast. The station here is operated by the local National Trust and features a small historical museum. After leaving Port Elliot the train climbs to the top of the coastal cliffs and passengers then experiemce some of the most picturesque coastal scenery on the Fleurieu Peninsula, with nothing separating you from the beach below and a perfect view of the Southern Ocean – in winter the home of Southern Right Whale. After a 30 minute journey the train edges into Victor Harbor station, right in the centre of the town and surrounded with its iconic pine trees. Here, the locomotive is detached from the carriages and turned on our specially retained 30m long electric turntable before rejoining the carriages for the return journey to Goolwa. The number of trains operated varies through the year. Passengers can buy tickets at any of our stations for one-way journeys in either direction along the line or for a bargain priced round trip. Trains wait for about 30 minutes at both Goolwa and Victor and roundtrip passengers can extend this period by returning on a later train. Trains are generally formed by our fleet of heritage Redhen and Brill Railcars, along with assistance from diesel locomotives. Steam is featured during most school holiday’s and on days where the Southern Encounter operates from Mt Barker. STEAM is planned to operate during the April School Holidays – including over Easter & the Goolwa Wooden Boat Festival when upto 6 return trains per day are scheduled.